OCSTA represents all of Ontario’s 29 English Catholic school boards. 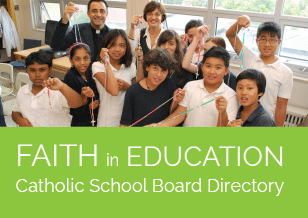 Together these school boards educate over 575,000 students in more than 1500 Catholic schools. Catholic schools have been operating since 1841 – well before Ontario became a province. In 1930, Catholic Trustees organized as an association to leverage their knowledge and experience in support of targetted advocacy efforts to achieve equitable funding and opportunities for Catholic schools across the province. Ontario’s Catholic schools have a well-recognized and celebrated tradition of providing inclusive, welcoming communities where all students are encouraged to realize their full potential as unique individuals created in the image of God. Catholic Schools are distinctive faith communities that nurture the spiritual, academic and physical needs of students through the integration of the Ontario Education curriculum with gospel values and sacramental life. Christ is the centre of the Catholic school and his presence and teachings permeate the school building. Ontario’s Catholic schools are a distinctive segment of Ontario’s vibrant public education system. Catholic schools are faith-based schools whose educational purpose is not only the transmission of knowledge; but also, the formation of the whole person in terms of body, mind and spirit. Ontario’s Catholic ratepayers represent approximately one third of Ontario’s tax revenue base and fund Catholic schools through their property, income and other taxes. At the secondary level, Ontario’s Catholic schools provide a choice to parents who want a spiritual, faith based learning enviornment, where the teachings of Christ are central to the mission and vision of the educational experience. Our Catholic schools are all-inclusive and we instil in students the values of tolerance, respect, love of neighbour and community service. Catholic schools share a foundational belief that all children are loved by God, are individually unique and that the school has a mission to help each student to fulfill their God-given potential in all aspects of their person: physically, academically, socially, morally and spiritually. Therefore, all students, regardless of background, heritage, race, economic and societal status, are accepted and supported in a safe and caring learning environment.